"Potatoes and clams in broth are served with crispy bits of fatback sprinkled over the top. If good fatback is hard to find in your area, you may substitute with bacon. This is the way they've made it down home for more than 100 years. It ain't fancy, but oh my is it fine!" Place fatback in a large skillet over medium-high heat, and cook until crisp. Remove pieces, and set aside. Reduce heat to medium, and add onion. Fry onions in the fatback grease until softened. Stir in potatoes, making sure they are well coated with the fatback grease. Season generously with pepper. Pour in the liquid from the clams, and the bottle of clam juice. Cover, and simmer gently for about 15 minutes. While the potatoes are simmering, chop clams into pieces. Add clams to potatoes during the last 3 minutes. Serve in deep bowls with the crispy bits of fatback sprinkled over the top. Here’s a hearty comfort-food classic to warm you up on cold winter days. I've been eating this for over 40 years and THIS is the true recipe - don't let the others full of vegetables fool you! 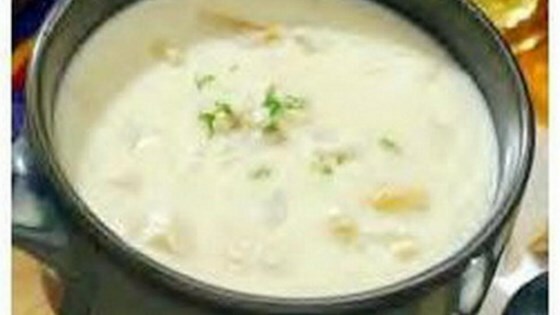 Come here for the original Cape Hatteras style clam chowder. it was pretty damn good... reminds ome of miller's in nags head. salem mass... HA! the only seafood worth eating up there is lobstah besides, who wants to eat anything made by a red sox fan! ?